Check in to these cosy bamboo cottages at a green, cool campsite close to Shimla. You'll be able to walk through apple orchards or pine forests, paddle in cold streams, or try your hand at on-camp activities like Burma Bridge, valley crossing, or hiking. In the evenings, as the temperature drops, you'll enjoy a crackling bonfire and later, you'll dig into delicious hot meals. At night, you'll sleep in a comfortable cottage with soft beds, attached washrooms, and the sounds of nature outside. This lovely camp, located at an altitude of 7000 feet in the Himalayas, is only 10 kms away from Shimla. The camp is a peaceful haven, set deep in cedar and pine forests, with apple orchards on one side. You'll be staying in a comfortable bamboo cottage with an attached washroom, and will have the comforts of an on-site restaurant and free WiFi. • Sign up for a comfy cottage stay in a Shimla campsite. • Enjoy a day of activities like Burma Bridge and valley crossing. • Wake up to spectacular views of the mountains all around. • Trek through pine forests and apple orchards. Bamboo Cottage stay in Shimla is a non-strenuous activity. However, if you have asthma, heart conditions, or spinal or knee problems, it is recommended that you consult your doctor before booking this trip. Travellers are required to adhere to instructions of the tour guide during any adventure activity in Shimla. Consumption of alcohol and drugs is strictly prohibited before undertaking any adventure activity in Shimla. For cancellations made 45 days or more before check-in to this Shimla campsite: 100% refund. For cancellations made 30-45 days before check-in to this Shimla campsite: 90% refund. 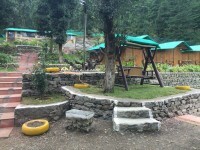 For cancellations made 30-10 days before check-in to this Shimla campsite: 75% refund. 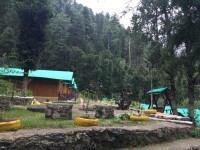 For cancellations made 5-10 days before check-in to this Shimla campsite: 50% refund. For cancellations made 0-5 days before check-in to this Shimla campsite: No refund. Accommodation for travellers younger than 5 years of age is not charged. Accommodation for travellers between the ages of 5-12 years will be charged at 25% of the package cost. Accommodation for travellers between the ages of 12-18 years and for an extra adult in the room is charged at 40% of the package cost. The tour operator takes utmost care to ensure safety of the travellers and shall not be held responsible for any mishap or accident during the bamboo cottage stay in Shimla. Today you'll check in to the campsite at 14:00 hrs. You'll be served a welcome drink, and then will be shown to your bamboo cottage. After that, you can relax on the camp, or you can go for a hike through Mashobra's cedar forests and pine forest trails, or try out the adventure activities at camp. In the evening, you'll be served tea and cookies, and can watch the sun setting over the mountains. At night, a bonfire gives you a chance to enjoy some quiet time, and then it's time for dinner. Overnight in cottage. Today you wake up in your beautiful bamboo cottage and step outside to take in the views of mountains around. You'll dig in to a big breakfast and can stroll around Mashobra or chill at the campsite. Check out is at noon. Your trip ends here. You can check-in at 14:00 hrs, and will be served a welcome drink. After that, you'll check in to your bamboo cottage on twin-sharing basis. Each cottage has an attached washroom, a comfortable bed with all bedding, and towels. You'll be served evening tea and biscuits, and will eat a hot dinner after the bonfire session. Today you'll be served breakfast, and you have the rest of the morning free to spend as you please. You will need to check out by 12:00 hrs. Trip ends here. 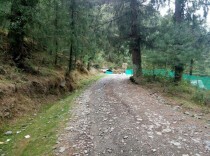 The campsite is located in Mashobra, about 10 kms from Shimla. You can land in Chandigarh and then take a taxi to Mashobra which is 66 kms away.